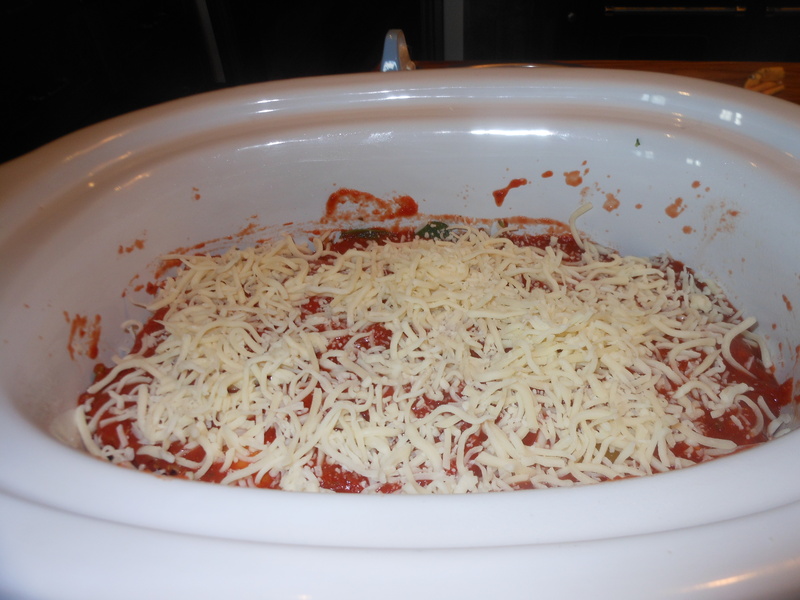 I have to say when I first heard about lasagna in the slow cooker I was sort of skeptical. My friend Cathy told me about it; she said she had made it for her family and I should give it a go. The original recipe is from Jessica Seinfeld, who sneaks vegetables and healthy stuff into her food. I did make a few changes from original recipe , I used more sauce and a little more salt , I used fresh spinach which can easily be substituted for ground turkey, sausage, or any type of meat you like. Next time I make this recipe I will be using meat because it really was quite easy and pretty quick even by slow cooker standards. It cooked in 3 1/2 hours, looked amazing and tasted delicious. I am still a little surprised by how good it was. The spinach wilts down and almost looks like basil in there. Even if you don’t like spinach, don’t worry because even though you start out with 5 ounces (which looks like a lot), you hardly taste it at all but for those of you who do like it, it’s an added bonus. This lasagna was moist, cheesy and hearty. So get out your slow cookers and give it a go. This is especially great for a big crowd. It easily serves 6 people. 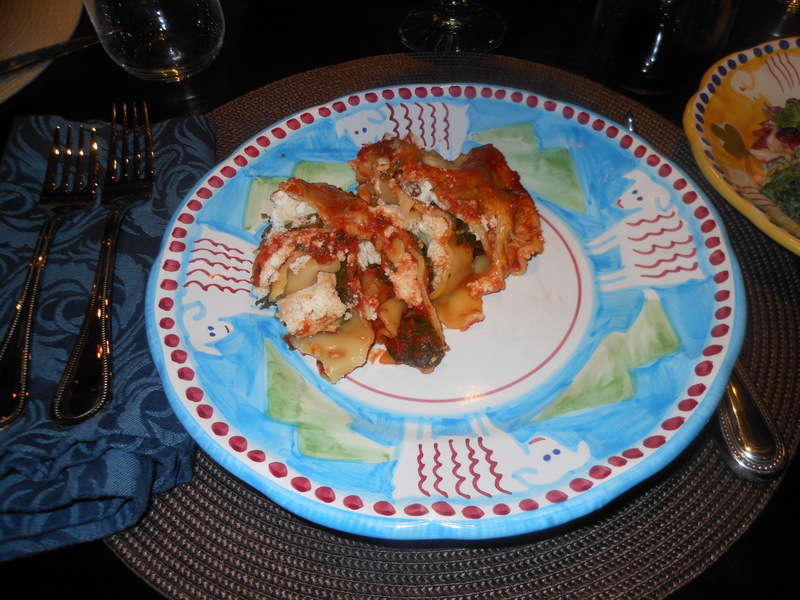 We of course had a chicken dish alongside, because no amount of prodding could get Joel to try the lasagna, once he saw the spinach. Oh well, what are you going to do? He doesn’t know what he’s missing. Thanks Cathy for the great idea, and of course, Jessica Seinfeld. 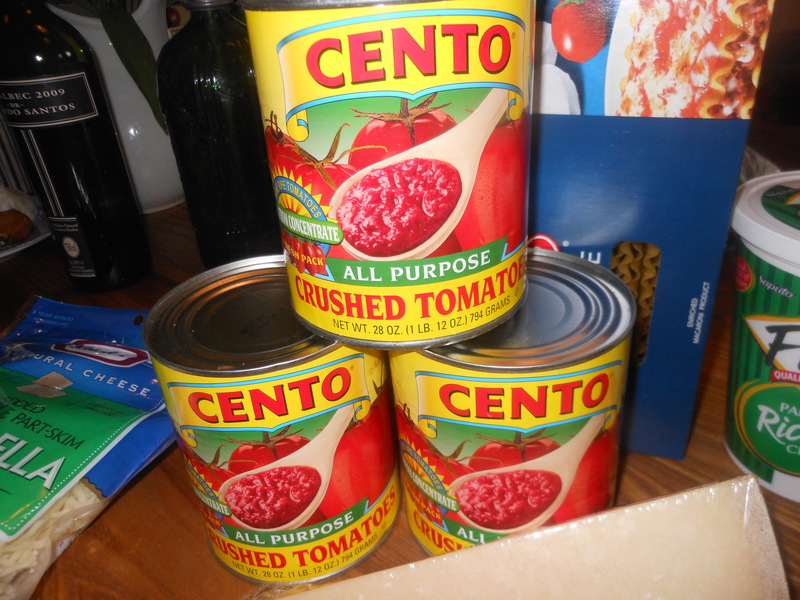 In a medium bowl, combine the tomatoes, garlic, oregano, salt, red pepper and black pepper. In a separate bowl, mix the ricotta, 1 cup of the mozzarella and Parmesan. 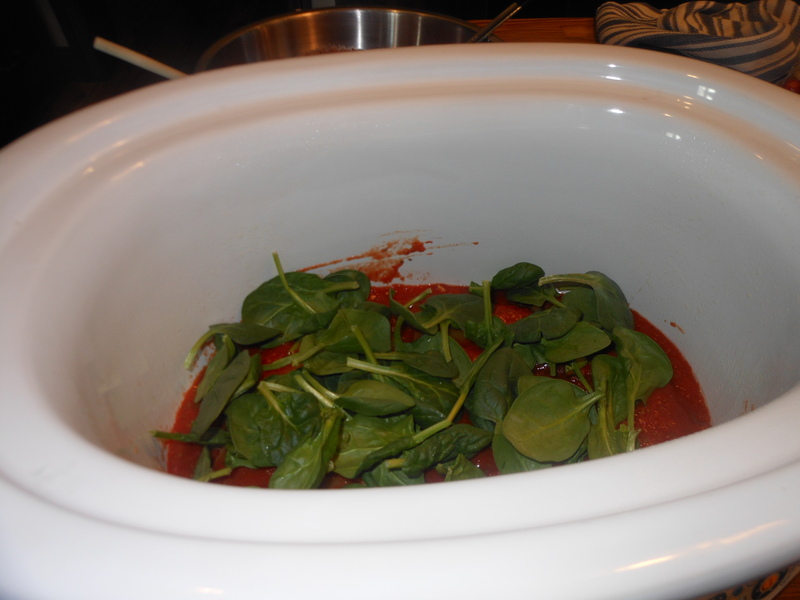 In the bottom of a 5 – 6 quart slow cooker (which I sprayed with Pam first), spread a thin layer of sauce. Top with 3 of the noodles (breaking to fit as necessary). Spread about 1 cup of the sauce over the noodles and layer with 2 cups of the spinach and 1 1/2 cups of the cheese mixture. Repeat twice more with the noodles, sauce, spinach and cheese mixture. Top with the remaining 3 noodles, sauce and 1 cup of shredded mozzarella. Cook on low, covered, for 3 – 3 1/2 hours. Noodles should be tender in center by then, mine was. I then switched it to warm until we ate it. I served it from slow cooker with a big spoon, you don’t get those neat little squares but it really held together quite well, I left some in fridge for leftovers and froze the rest for another time. *I broke the side noodles in 1/2 and just angled them a little, keeping the center one intact. Once it’s all cooked it doesn’t matter that they were broken, it really came out perfectly.